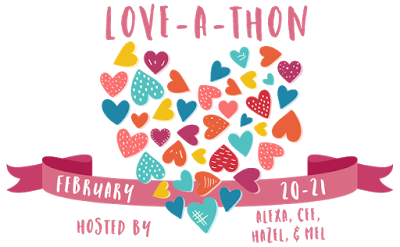 This year I am participating in the Love-a-thon again. My name is Kaitlin Michelle! Hello! I am blogging from the suburbs of Houston, TX. Way, way, back in the day, I used to have a livejournal page. And I really liked having a place to keep my thoughts and connect with other people. Then I started following a lot of book blogs, and decided I wanted to have a blog as well. This is my second blog, my first one (kaitlinmichlle.com) had issues with hosting, and lost all of it’s content, so I decided to scrap it and start fresh here. young adult definitely, but there are some adult books, and memoirs as well. Blogger Interviews, Author Interviews, Giveaways, Book Tours, random other stuffs. Getting to fangirl with everyone. Everyone is super nice. I don’t have a lot of people I can talk to about all the books and things in real life, so I love connecting with everyone here. Obvi I need my bestie Hermione Granger, and my BF Jason Haley. I would also want Hatter Madigan from the Looking Glass Wars, Katniss Everdeen from the Hunger Games, and Tobias from Divergent. I like crafting, and cooking. Turn the Harry Potter books into a series!!! OMG so many! #1 is probably JK Rowling though. PS: Anything else you would like to know? I see that Blackhearts in on your list, and I’m just about to start it. A blackbeards origin story – I CANNOT wait! Lovely blog, and I’m a new follower! Yes!!! Let me know what you think!!! Hi Kaitlin! I’m with you. I love fangirling with everyone in the bookish community. They are my people! I am a huge Halsey fan so I love that you chose Gasoline as your jam! I also love to cook too! I still need to read the lunar chronicles!! Nice to meet you, Kaitlin! I have been loving Halsey’s music too. It’s just so catchy! I think my favorite song of hers is Colors. I want to read Dear Bully this year too. Hopefully I can get to it for the Anti-Bullying Readathon. Oh I didn’t know there was a readthon! Love your library picture – so pretty. I also chose Hermione as my bookish BFF – yay for all things Harry Potter!! (can’t wait for the Cursed Child now that I know it’s a thing). BTW, I’m reading Passenger right now and it is THE BEST. Hope you enjoy the Love-A-Thon! Omg! Yas! To the Cursed Child!! I can’t wait!!!!!! !